Judy Reese Morse is the Deputy Mayor for Citywide Initiatives for the City of New Orleans, which means she oversees Mayor Mitch Landrieu’s office and is responsible for overseeing policy development and strategic planning for economic development, education, social innovation, cultural economy, and more. There are three programs that have come out of the Mayor’s Office under her leadership that are having a significant impact on social equity and social justice in the City of New Orleans: #EquityNewOrleans, an initiative to ensure equity in city policy; NOLA for Life, the city’s comprehensive strategy to reduce murder among young Black men; and the Welcome Table New Orleans, an initiative on race, reconciliation, and community building. Morse’s interest in equity, fairness, and justice comes from an early age observing the work her father did. Morse, who has worked at all levels of government – federal, state, and now local in the Mayor’s Office – has always been attracted to the idea of finding a common ground among different people and looking at how policies, programs, and services can come together so that not only can everyone be served, but they can be served well. Morse came on board with the Landrieu administration as Deputy Mayor and Chief of Staff in 2010. 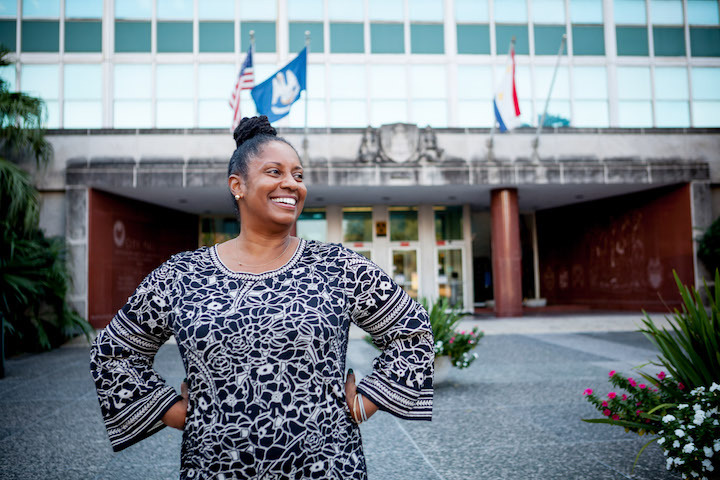 Since Mayor Landrieu’s reelection in 2014, Morse has been the Deputy Mayor for Citywide Initiatives and in that role has had the opportunity to be much closer to the work that has been a priority for the Mayor’s Office. It began with NOLA for Life in 2012, a citywide murder reduction strategy for young African American men ages 16-24. It is a five-pillar comprehensive strategy that focuses on law enforcement, prevention, intervention, and rehabilitation. She says that the goal on the enforcement side is not to arrest people but that the choice is really up to the individuals themselves. Welcome Table New Orleans launched in 2014 as a three-year citywide racial recognition initiative gathering New Orleans residents ages 18 and over from across the city to meet once a month in facilitated circles to tackle issues of race on their own and as a circle come up with a reconciliation project that addresses those issues – something that would raise awareness of the need for racial reconciliation. It was a 12- to 18-month process for every circle, and they ended up with eight citizen circles meeting in six different parts of city after an open call was put out for participants. The projects that developed from these circles include two youth symposiums where young middle schoolers from public and private schools – Black, white, Latino, and Vietnamese –are using curriculum developed on the subject of race. There are murals popping up, a genealogy project in which students learn about their histories and backgrounds (with inevitable surprises), a three-part film series, and an “equity circle” built space in the city where people can sit and have these same kinds of conversations that also has a playground for kids to play while the adults talk. There is also a Mother’s Circle for mothers who have lost a child to gun violence, which has already led a peace march in the city, led an effort to reconcile with mothers of perpetrators, and will lead a five-part workshop series called “From Tragedy to Triumph” that focuses on different parts of the healing process. With the exception of one circle that agreed to be filmed (that film is available to view on the Welcome Table New Orleans website), each circle was kept confidential to allow people the space to share and be honest and not have anything they say be used against them. The next progression of that work is to look at the system itself – the City of New Orleans government – and whether or not that system is delivering its programs and services and making policy decisions with racial equity in mind based on data and external input. From that came #EquityNewOrleans. Launched in 2016, #EquityNewOrleans is another citywide initiative that assesses the role of equity in government, conducting a quantitative and qualitative process that will lead to a strategy for equity in government so that the city will have well-researched data as well as a very strong qualitative component that will have engaged a number of people across the city to make recommendations about what equity in government looks like. So, what does equity in government look like? That is a question that the Mayor’s Office will attempt to answer in April 2017, after spending a year on the process of developing their strategy for creating an equity-minded government. To develop this strategy, the City has been hosting focus groups and community listening sessions, asking hundreds of people so far questions like: What is your vision of equity? What do you think the government should do? What is the government’s responsibility? While all of these programs are products of the current administration, Morse says that the Mayor’s Office will give a “long-term, strong recommendation” to the next administration that the government continue to invest in this body of work beyond this administration. So why is New Orleans taking on all of these very complex, highly sensitive emotional issues? Morse explains it with one word: leadership.